RoyalProtocol is a 21-year-old student from Northern Ireland who has attended many royal events over the last few years. He has been presented to The Duke of Edinburgh and is often invited to state occasions such as the Garter Service and Royal Maundy distribution. He therefore has an inside insight into the goings on at court and the etiquette which surrounds The Queen and her family. In the face of a national decline in deference and decorum, the Royal Household is one of the last bastions of good form, etiquette, and protocol. 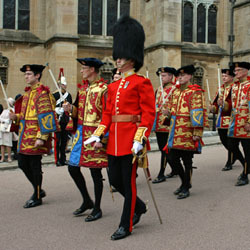 No other institution prides itself quite so much on its ability to ensure that at all times people are addressed correctly, letters meet with Debrett's approval (in fact the Royal Household usually sets the standard), orders and decorations are worn correctly, and umbrellas are carried as in times gone by on Whitehall. The Old Guard still reigns at Buckingham Palace. "Mr and Mrs Charles Beaufort present their compliments to the Lord Steward and have the honour to obey Her Majesty's command to attend the State Banquet at Buckingham Palace on Wednesday 12th March 2008 in honour of Their Majesties the King and Queen of The Hashemite Kingdom of Jordan." From here you begin your path to one of the most memorable experiences of your life. The most memorable royal gathering at which I have enjoyed being present was the Garter Service in 2007. I departed London for Windsor by train early on Monday morning, dressed in my morning suit with my top hat, and was glad I had brought my umbrella. The first half of the day was wet and dreary, and the Royal Household was considering cancelling the Procession of the Garter Knights and bringing them to St. George's Chapel by car. However, by about 1.30 p.m. the skies cleared and it was decided that the procession would go ahead as planned, which I am sure was a relief to the crowds gathered in the Castle Precincts. The congregation in the Chapel was seated by 2.30 p.m., and we eagerly awaited the progress of the procession through the nave into the Quire. 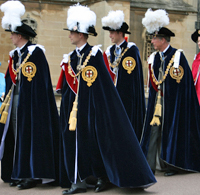 The heralds, clergy, and choir passed through the nave followed by the Knights of the Garter. The Royal Knights - Princess Alexandra the Hon. Lady Ogilvy, The Duke of Kent, The Duke of Gloucester, The Duke of York, The Princess Royal, and The Prince of Wales - then processed to their seats. A fanfare was sounded, and The Sovereign, accompanied by Prince Philip Duke of Edinburgh, made her progress to her stall. The service began with a rousing rendition of two verses of "God Save Our Gracious Queen." Prayers were offered for the Sovereign and the Knights living and departed of the Most Honourable and Noble Order of the Garter. The hymns included "Now thank we all our God" and "All creatures of our God and King." The service concluded with the Blessing and a long procession, this time including The Right Hon The Baroness Thatcher LG OM and the spouses of the Garter Knights. There was then a jolly carriage procession for the royal family, and we were lucky to see them return up the hill to the Castle after we left the Chapel by a side door. The afternoon ended with a lovely tea in the Vicars' Hall and a tour of the Chapel to see the Sovereign's Stall and the resting place of His Late Majesty King George VI, Her Late Majesty Queen Elizabeth The Queen Mother, and The Late Princess Margaret Countess of Snowdon. It was quite a sight to see the congregation, of which I was privileged to be a member, leave the castle, with the men dressed in morning suits and the ladies wearing hats and white gloves; it really was a scene from a bygone age which thankfully is preserved on these state occasions organised so wonderfully by Her Majesty's Household. Making obeisance is not an idea ingrained in people's minds; one has therefore to consider the reasons behind this ancient form of showing deep respect to someone of authority. Today when you attend a royal function you may be shocked to see a line of bobbing ladies and bowing gentlemen. However, this form does endure and provides a continuity at events attended by The Queen and her family. While it is no longer considered absolutely necessary, many people still make their bows and curtseys to Her Majesty and Their Royal Highnesses. Gone are the days when young women paraded before their Sovereign like vestal virgins adorned in white with feathers, trains, and fans to make their deep, reverential, and well-practised curtseys. Today ladies may practise in front of their mirrors the night before they go to the Palace, but few take classes at the famous London finishing schools such as Lucie Clayton or dance classes at establishments such as Vacani's School of Dance, where The Princesses Elizabeth and Margaret learned to dance as children. The curtsey is a difficult manoeuvre to execute; if it goes right it looks excellent as you descend towards the ground while shaking hands with The Queen, but if it goes wrong you may end up falling over and making a fool of yourself in Her Majesty's gracious presence. According to Debrett's New Guide to Etiquette and Modern Manners, "Low sweeping curtseys, although usually well meant, are best reserved for the amateur dramatic stage and can be the subject of some amusement within Royal circles. Opt instead for a brief bob with the weight on the front foot." I must disagree; I have seen low sweeping curtseys performed with grace and deference and Her Majesty appeared delighted. The curtseys executed by Lady Thatcher are one such example. However, if you are likely to come to grief while attempting this feat, it is safest to stick with the experts' advice. Men are blessed with having only to bow, the most simple act. A correct bow involves a deep nod, not a bow from the waist. Bowing from the waist should be reserved for when you are in Japan. When to make your obeisance is also a vexing question; it depends on the situation. At a church service, bow or curtsey as the royal personage passes on the way to or from his or her seat; at a garden party or other social gathering, wait until presented or when the royal personage is passing. If in doubt, consult the Household, who will be very helpful. When you are attending royal events and are unsure about something, the Royal Household is of great help and will answer any questions; the members of the Household are always very well informed. It is important, however, to make sure that you contact the correct branch of the Household for help with your particular situation. Each member of the royal family has his or her own Household, so you should not telephone the Information Office at Buckingham Palace to enquire if you should wear a lounge suit or dinner jacket to a reception at Kensington Palace hosted by the Duke and Duchess of Gloucester. The households of the individual members of the royal family vary in size; minor royals often have only three or four on staff. The Queen's Household does not deal with enquiries regarding royal family members when the query is the remit of another household, so enquiries should be directed to the appropriate Private Secretary. You should be thoughtful and considerate when approaching one of the royal households: try and get the right address or telephone number, and always have your questions prepared in advance. Thus, questions about The Queen's invitations, etc., should be addressed to the appropriate department (in this case the department that issued the invitation). Likewise, if you have questions regarding The Prince of Wales and Duchess of Cornwall, you should contact Clarence House. The dress code for an event is always given on the invitation. Morning dress for men consists of a grey or black morning coat with a grey or yellow waistcoat and striped grey trousers. A top hat should be worn, and grey or yellow gloves (matching your waistcoat of course!) should be carried. Ladies are in this case expected to wear smart day dress: a suit or dress with hat and gloves, high heels, and a handbag to complete the outfit. Lounge suits are just plain business suits and are now the form for the majority of occasions; again, smart day dress is the correct outfit for ladies. Black tie calls for dinner jackets to be worn with a smart bow tie. Ladies should wear an evening or cocktail dress (it is best not to wear black, which is really only appropriate only when the Court is in mourning). Finally, white tie involves an evening tail coat with white bow tie and waistcoat for men and long evening dresses with long gloves and best jewellery including tiaras for the ladies. Orders and decorations are worn by everyone entitled to do so, though it is important not to wear the collar of an order (these never appear after sunset). The colour of Her Majesty's clothes is never made known in advance, so don't be tempted to telephone the Household before an event to make sure that you aren't wearing the same colour or that your choice of outfit with clash with The Queen's. Once you have been presented, you are faced with the question of what to say. The Queen is always addressed as "Your Majesty" on the first count and thereafter as "Ma'am"; according to Buckingham Palace, this should rhyme with jam, not palm. Other members of the royal family are treated with similar respect: "Your Royal Highness" then "Sir" or "Ma'am." You should let the royal personage lead the conversation, not try to change the subject, and ask only the politest of questions. "Is Your Majesty enjoying the performance?" is acceptable, but "How's Philip and Charles?" is most definitely, absolutely out of the question. When referring to The Queen, "The Queen" is fine, though if you want to be certain of being polite I would recommend at least once saying "Her Majesty." It is also quite rude to refer to Prince Charles, Prince Philip, or Princess Anne; instead, you should opt for The Prince of Wales, The Duke of Edinburgh, and The Princess Royal. "His Royal Highness" or "Her Royal Highness" may also be used, though be sure to qualify whom exactly you are referring to. When you are in conversation with a member of the royal family, be yourself but remember that His Royal Highness is not going to appreciate your company if it is too loud, tongue-tied, rude, or bumptious. When making a formal speech in Her Majesty's gracious presence, it is correct to begin with, "May it please Your Majesty," and at the end it is only courteous to say, "Ladies and gentlemen, I ask you to rise and join me in a toast: The Queen!" One of the most complicated aspects of court life is precedence. The Sovereign's precedence is absolute, and The Sovereign can determine where on the scale everyone else falls. Officially The Sovereign is at the top of the scale followed by The Prince Philip, Duke of Edinburgh. Including male adults of the royal family only, His Royal Highness is followed by The Prince of Wales, The Sovereign's two younger sons (The Duke of York and The Earl of Wessex), The Sovereign's grandsons of male descent (Prince William and Prince Henry), The Sovereign's cousins (The Duke of Gloucester, The Duke of Kent, and Prince Michael of Kent), eldest sons of Dukes of The Blood Royal (Earl of Ulster and Earl of St Andrews), and younger sons of Dukes of The Blood Royal (Lord Nicholas Windsor and Lord Frederick Windsor). Among the female members of the royal family, precedence is an important part of life. 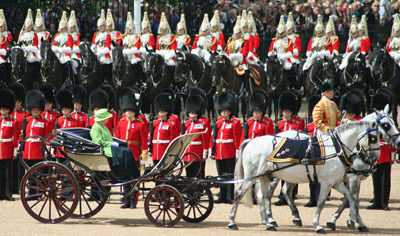 The Queen is followed by The Duchess of Cornwall and The Countess of Wessex in official precedence. However, it has been claimed that for court functions Her Majesty has decreed that The Princess Royal and Princess Alexandra should be of higher precedence by right of their being Princesses of The Blood Royal. I have included here the official order of precedence for female adult members of the royal family: The Queen, The Duchess of Cornwall, The Countess of Wessex, The Princess Royal, Princess Beatrice, Princess Eugenie, The Duchess of Gloucester, The Duchess of Kent, Princess Michael of Kent, Princess Alexandra The Hon. Lady Ogilvy, Miss Zara Phillips (by courtesy), Countess of Ulster, The Lady Davina Lewis, The Lady Rose Gilman, Countess of St Andrews, The Lady Nicholas Windsor, The Lady Helen Taylor, The Lady Gabriella Windsor, Mrs James Ogilvy, Miss Marina Ogilvy. These tables of precedence are often changed to suit the occasion; however, on a formal state occasion they are strictly adhered to and are designed to ensure that everyone knows his or her place in the royal pecking order. A vital point to remember is that the United Kingdom does not enjoy a monopoly on royalty or indeed on the points of etiquette surrounding these ancient thrones. In general, foreign royals are treated in a similar manner to those of Queen Elizabeth's family and line. Kings and Queens are afforded "Your Majesty" and a deep and respectful curtsey or bow. The Emperor and Empress of Japan are "Your Imperial Majesties," while their family are Imperial Highnesses. Serene Highnesses, Grand Ducal ones, and the occasional plain "Highness" do exist, and careful note should be made to ensure that no one is offended. As a general rule, the children of Kings and Queens enjoy the status of Royal Highness; this is also true of the Luxembourg Grand Ducal Family. A Serene Highness is from a reigning Princely House such as Liechtenstein or Monaco, while an Imperial Highness is from Japan or the former Austrian Empire. When one finds the need to communicate by mail with a member of the royal family, there are many points of protocol to remember. Letters should of course be concise and polite. They should (by tradition) be addressed to a member of the Household (e.g., Private Secretary, Lady-in-Waiting, or Equerry); the royal recipient should be referred to as Her Majesty, His Royal Highness, Her Royal Highness, etc. However, it is in very exceptional circumstances, such as a royal engagement, marriage, death or other very personal occasion, permissible to write directly to the royal personage. In this case an exact and formal protocol exists. Letters to The Queen should begin either "Madam" or "May it please Your Majesty" and end with the sign-off "I have the honour to remain, Madam, Your Majesty's most humble and obedient servant." "You" should be substituted with "Your Majesty" and "your" with "Your Majesty's." Address the envelope to Her Majesty The Queen, Buckingham Palace, London SW1A 1AA, and wait for your reply, which more than likely will come from a Lady-in-Waiting). Letters to other members of the royal family should start with "Your Royal Highness" and end with "I have the honour to remain, Sir/Madam, Your Royal Highness's most humble and obedient servant." Meeting a member of the royal family can be a wonderful experience; however, if it is to be an enjoyable experience for all concerned, it is best to stick to the guidance given by the Lady-in-Waiting or the Lord Lieutenant. Do what you are told and you are more likely to be invited back; behave in an inappropriate manner and you will be cast into social Siberia. The guidelines which I have given in this article will hopefully help (of course I do realise that there will be readers who feel that these protocols and forms of etiquette should have gone out with the Ark). I believe that the best approach can be summed up by "When at a royal gathering, do as The Queen would expect; after all, you are Her Majesty's guest." However, will these traditions endure after the current reign? The Prince of Wales is a stickler for tradition, so perhaps his court will not be a major departure from the current form. However, will Prince William end these many traditions? Only time will tell, so as one who thoroughly enjoys Royal Protocol I can say only, "God Save The Queen!" and "Long may she reign!" Morrow, A. 1983. The Queen. Richard Clay (The Chaucer Press), Bungay, Suffolk. Morgan, J. 1996. Debrett's New Guide to Etiquette and Modern Manners: the Indispensable Handbook. Headline, London. 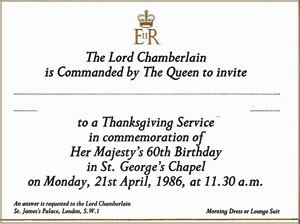 Photo of royal invitation used with permission from the Lord Chamberlain's Office and the Office of Public Sector Information. Photos of the 2008 Garter Procession, including heralds and pursuivants, Royal Knights, Prince Harry and Kate Middleton in formal day dress, and Windsor Castle, taken by Flickr member Niquinho and used with permission. 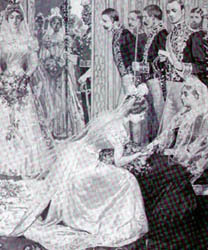 Debutante making obeisance to Queen Victoria: public domain. Photo of the 2007 Trooping the Colour ceremony taken by Flickr member Jon's pics and used with permission. 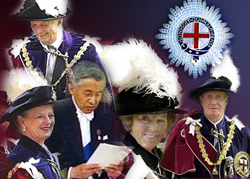 Collage of foreign monarchs wearing Garter vestments, created by Royal Forums member TheTruth and used with permission.